A few of the things that make Buckley ... Buckley. Assembly. One of the oldest traditions at Buckley, Assembly is a special time set aside every week for our boys to gather as a division and to learn, perform, or simply laugh together. 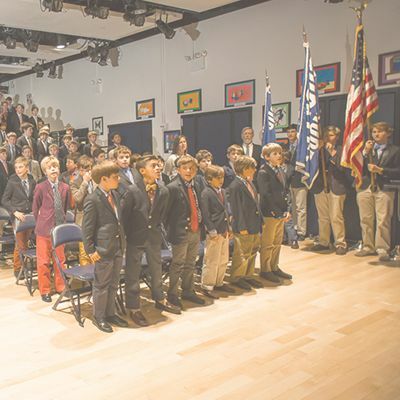 Assembly begins on a formal note: The boys walk in with their classmates; the Headmaster will share a reading; the whole group will join together in song, and then recite the Pledge of Allegiance while select boys hold the flags. After the boys take their seats, however, anything goes. There might be clowns. There might be birds. Often there are alumni speaking about their work or their passions. Sometimes there are class plays or speech contests. Sometimes boys share personal stories from their experiences in community service or from their discussions on diversity. Regardless of the agenda, boys take their seats in Assembly with excitement and enthusiasm for a moment together with their school. Dress Code. There is an adorable moment every spring when the Beginners walk over to "Big Buckley" to sit in the Class I homerooms they will occupy the coming fall. To prepare for this big step, the boys make construction paper ties and wear them over their polo shirts. And thus, after a year of settling into Buckley in shorts and polos, our youngest boys step into the Buckley dress code. We require a coat and tie, but it is not a uniform. Boys can show their personality by choosing their favorite tie color or wearing a non-blue blazer or brightly colored dress socks. The dress code is a reminder for each boy to take the school day seriously but allows him to have a little fun along the way. Family-Style Lunch. We eat together at Buckley. From the very beginning, our boys are taught table manners by sitting with a teacher for lunch and serving or being served by classmates. Napkins are put on laps; everyone waits until each plate is served to begin; and boys say "please" and "thank you" around the table. 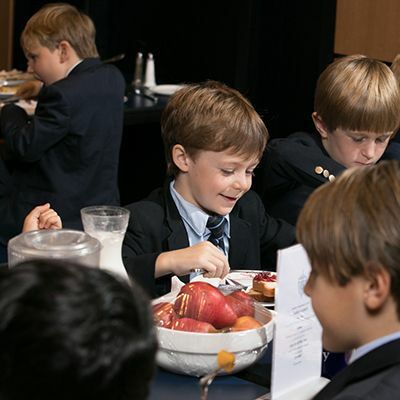 Lunch flies by at Buckley, but in those quick minutes when boys are eagerly eating, they learn how to be gentlemen. Student Council. Leaders aren't born; they are made. At Buckley, we take leadership seriously and feature it as a core part of our academic curriculum and prominent feature of our extracurricular school life. Beginning in the Middle School, boys run for officer positions in their homeroom. Every role from chairman to librarian is filled by election after each interested boy gives a speech to his peers. After three years of homeroom leadership opportunity, the boys enter our Upper School and can run for school-wide leadership roles. Our student council is over twenty boys strong, with representatives covering every aspect of student life at Buckley. They raise their own funds for charity; they design and sell merchandise; they make formal petitions (to add chocolate milk to the lunch menu on Fridays, for example! ); and they serve as ambassadors for the School at evening events and model students for the younger boys. Buckley's middle school focus allows boys to lead in those crucial adolescent years when they will need fortitude and composure the most. Our graduates often move on to pursue leadership roles in high school, college, and the professional world, and we are happy to have planted the seed while they were at Buckley.